Hi my name is Alex and I am very interested in tsunamis. So if you want to know about tsunamis I’m the one to see. A tsunami is caused by these five things an earthquake, a volcano eruption, a land slide or even a meteorite hitting the water. Isn’t that crazy? Tsunamis can go hundreds of kilometres per hour. The deeper it is the faster it goes. Tsunamis are very disruptive because they can take down buildings even tall ones. The biggest tsunami recorded was in 1883 following a volcano eruption on the Indonesian island of Krakatoa. The tsunami killed over 35,000 people in Indonesia almost ten times the number of people who died from the eruption. When a tsunami hits it can cause massive damage to property and the environment. To be safe people need to run and find high ground. Japan has Lots of tsunamis each year. Most people drown or get injured from wood or metal and pieces off houses or buildings that are in the water. After a tsunami stops you could see what the damage the tsunami did to the place it hit. So I am sure that you believe that I am really interested in tsunamis. I must be because I can spell tsunami!! I love playing cricket. My favourite thing is to bowl people out. It is exciting when the ball smashes the wickets. They have to go off the field, “on ya bike mate”. I love the feeling of taking a hard catch into my hands. It is fun playing cricket in my back yard and they have to give me the bat when they are out. It’s great watching cricket especially when Brendon McCullum starts smashing the ball for a six! In the world cup cricket game when the Black Caps were playing the West Indies the crowd was going Guptill , Guptill, Guptill. I love test cricket at the Basin Researve, one dayers t2os and cricket in the backyard. AB Devilliers is the best batsman in the world! He can play all of the shots drive, dance down, pulls, scoops, ramps and cuts. Malinger the slinger is my favourite bowler. When he starts he always kisses the ball. He loves cricket, he slings the ball fast and does Yorkers or toe jams. My dream is to be a black cap because I love cricket. My goal is to practice hard to make the reps and play in the Black Caps. I could hear the noise of the waves the glass bottom boat created and very faintly taste the salt water from the sea. The man driving lifted the bottom of the boat and (it used machines to lift it) before he did he warned us it would bang in the middle. The floor lifted up and ’BANG’’ everybody got a fright, including me. He fed the huge snapper that we could see through the glass on the bottom of the boat. We drove along with the floor still up. Cathedral cove was beautiful, the beach was packed with shouting people. The amazing stone arch had beautiful golden sunlight shining right through it. There were signs warning about falling rocks. Cathedral cove reminded me of prince Caspian when Peter, Susan, Edmund and Lucy ran out of it from the train station. Huge sparkling waves crashed on the shore, wetting heaps of people. Cathedral cove is actually a little bit famous worldwide. That was an amazing trip I thought. One day our teacher told us to write a story about, Where the Wild Things Are. Our teacher read us the story and then we had to write our own story. My monster has blue coloured fur that’s as soft as candy floss. His eyes are as big as tennis balls and he has big sharp horns sticking straight out of his head. He also has long puffy hair, with very long sharp claws, sharp teeth and a very pointy nose. My monster is very loud, he growls and he roars but he likes to sleep because he is very lazy. He shouts every time he sees a cat on our lawn to frighten them away. My cuddly big monster likes to play on the swing he also likes me to say Lula byes to him so that he can get to sleep. My monster does not like to have birthdays but he does like chicken boned cake but I think that’s yuck. He does not like his big cheesy toes to get rubbed because he thinks it’s a bug trying to eat his toes but does like people paying attention to him. My monsters mum is away doing sports so he is at our home every day. My monsters most loving person is me because he likes to play, run, and sing all day with me. 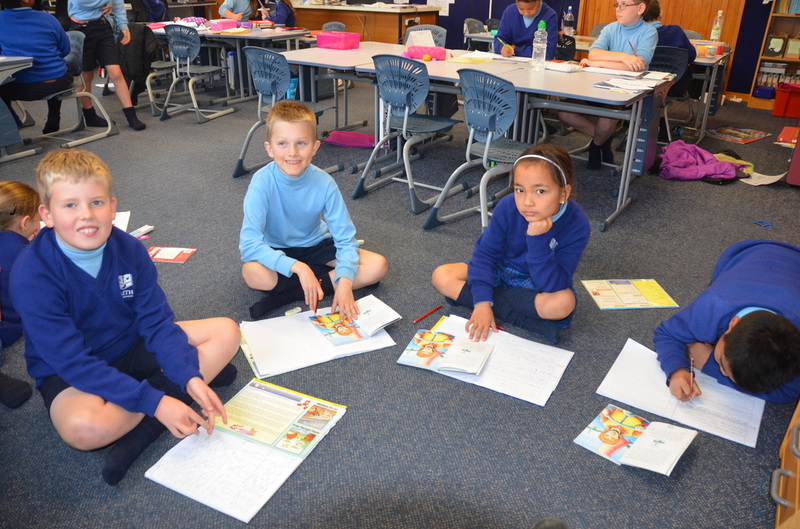 we are learning to summarise stories that we are reading by using "key words" and "topic sentences"
At Faith City School in term 2 we did Cultural Studies and at the end of it we had a celebration that we called Cultural Day. The celebration started at lunchtime when we all had some yummy food to eat from a variety of cultures. After that our parents visited our rooms to see the displays we had created. In maths we are learning to use tidy tens to solve simple addition and subtraction problems. PrEP is when we make products to sell on market day. We learnt about the real world of job interviews and working together.